I’d love to see an in-depth look at the different types of nosebands and their effects. Also, a discussion about martingales: the who, what, where, and why to use them. 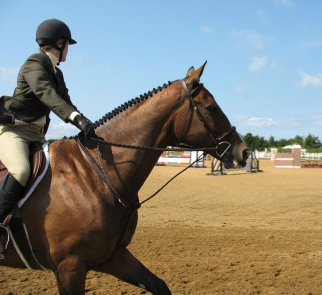 Both martingales and nosebands, when used properly, are to give a horse boundaries. They should never be used to tie a horse’s head down, nor to clamp a horse’s mouth shut. First of all, we need to understand that because horses are flight animals by nature, any feeling of entrapment causes panic and anxiety. 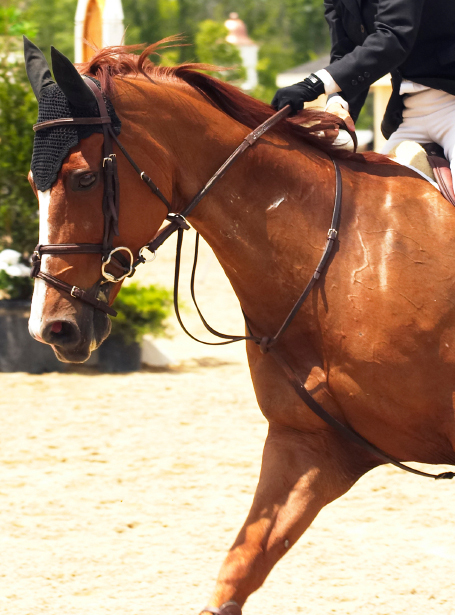 Many studies around the globe have been done on the effects of nosebands that are too tight. Increased heart rate and pulse are the results across the board. There are many acceptable nosebands, and different ones are allowed for different disciplines. The hunter cavesson should be attractive, wide, placed four fingers under the cheek, and fastened snug (but with still two fingers width of room between it and the jaw to allow the horse to chew the bit). This is the only legal type noseband you can use in hunter classes. For the jumper ring there are more choices. My favorite is the figure 8. The button should fit high on the horse’s nasal bone to allow proper pressure without restricting airways. This type of cavesson allows the horse to salivate and chew the bit, but prevents the horse from opening their mouth excessively to evade the bit. Another option is a flash noseband. When using this attachment, it is very important to adjust the cavesson higher on the horse’s head (than the hunter type) so it sits two fingers under the horse’s check bone. This will place the flash attachment high enough to properly place parameters on how much a horse can open his mouth without cutting off the breathing. A dropped or crank noseband sits quite low on the horse’s muzzle, and is much more severe than the types listed above. These are my least favorite as they cause undo stress due to the tightness and position. 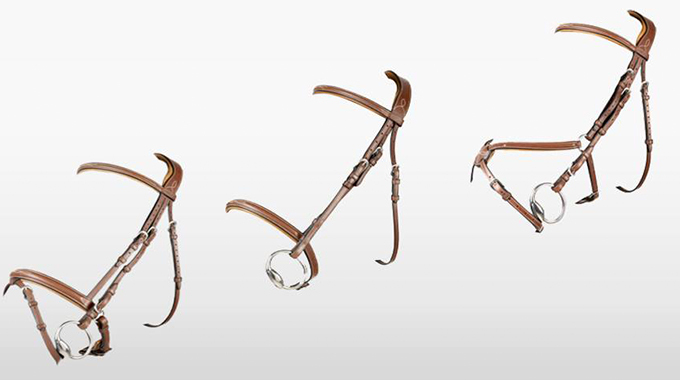 Antarès Sellier bridles L-R: Flash noseband, regular noseband, figure eight noseband. A standing martingale is most common in the hunter ring, but is also allowed in the jumper ring (up to and including 1.30m jumpers), except in Young Jumper Championships classes and some other special classes. 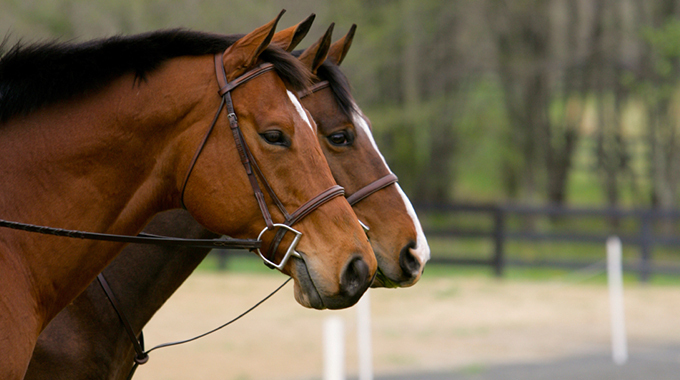 A standing martingale, when adjusted correctly, should touch the middle of the horses neck underneath, but not the throat. A standing martingale should never be used to tie a horse’s head down, and not so tight the horse leans against it. A martingale adjusted too loose causes concern for catching a leg in the air with a snappy jumper. I quite like standing martingales for use with young horses, as they prevent them from throwing their head up and hitting you in the face! Again, it’s a boundary not a tie down. Horse is wearing a flash noseband and a running martingale. Horse is wearing a regular noseband and a standing martingale (that is perhaps too short). A running martingale is more sophisticated as it works on the horse’s mouth, where as the standing martingale works on the nose. Adjusted correctly, the rings of the running martingale should nearly reach the horse’s withers. 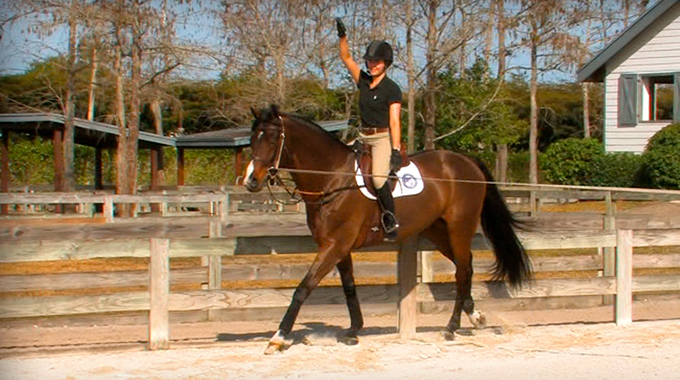 A running martingale should never break the straight line (pulling down) from bit to the rider’s elbow. And should always be used with rein stops to prevent the rings of the martingale from getting stuck on the rein connection to the bit. 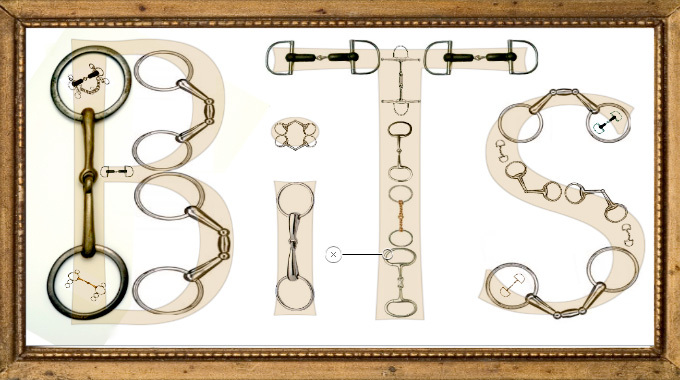 A bib martingale is another version of the running martingale, most associated with race horses. I like the bib martingale for use with the jumpers, as it gives more stability than a traditional running martingale. Because horses have different conformation, past problems (caused by people), and are at different levels of training, you should experiment to see what works best with your horse. Just remember the purpose that nosebands and martingales were designed for, and use them in the proper way, with the proper adjustment to help you and your horse communicate better and form a better partnership! 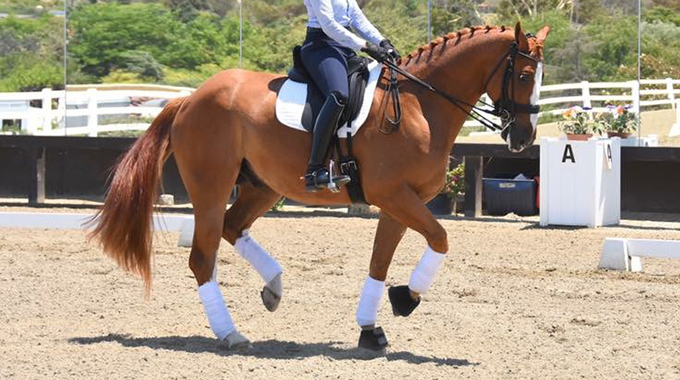 Bernie emphasizes why continued lunging without stirrups can help a rider learn to relax their hips and sink into the horse so they can follow the motion of the canter. Bernie gives a member an exercise to help her stop pulling on her horse's mouth 1-3 strides out from the jump. Where do my eyes focus when approaching a jump?